I missed this book in high school. In fact, I missed most books in high school. We just didn’t read that much in school. I have debated reading this book for a long time. I have friends that love it and declare it one of the best ever written and my husband is definitely not a fan calling it “one of the most over hyped books.” After listening to both arguments, I finally decided to just read it for myself. My conclusion? I have never wanted to throw a book against the wall so much in my entire life. I loved it and I absolutely hated it. The background for the Giver (in case you happen to be one of the people who missed it too,) is a boy who lives in a Utopian society. In this society, everything is strictly regulated and no one knows much about the outside world, expect the Giver. The Giver, is the receiver of memory, it is his job to hold all of the memories of the world so he can advise the leaders. Jonas is selected as the new receiver of memory and he begins to learn what the world outside of the community is like. I was against the community in the beginning, I have a strong will and not having options and being able to make my own decisions would drive me crazy. Then as I read more about this community, I went from being against it to hating it. The horrible things they did to keep sameness and order. Picking every body’s job for them, segregating the elderly from the community, not allowing women to have their own children rather selecting, naming and giving the child to them and the most frustrating to me, euthanizing one twin when they are born to keep order. Sometimes in life, I have thought that getting rid of all pain and suffering in the world would make it a better place. After seeing that in practice in this book, I don’t think it is a better place at all. If we never had sad times, we would never know when we are happy. I would rather go through all of the sadness I have had in my life and be able to have the happiness again too than feel neither emotion at all. Overall, I rate this book really high. I hated it, I wanted to throw it against the wall. I wanted these people to open their eyes but it was eye opening to me because although I have wished for a life without pain, I never thought what that life would be like. I would rather suffer from emotional pain than ignorance. You do know there are two other books in this series, right? Gathering Blue and The Messenger. 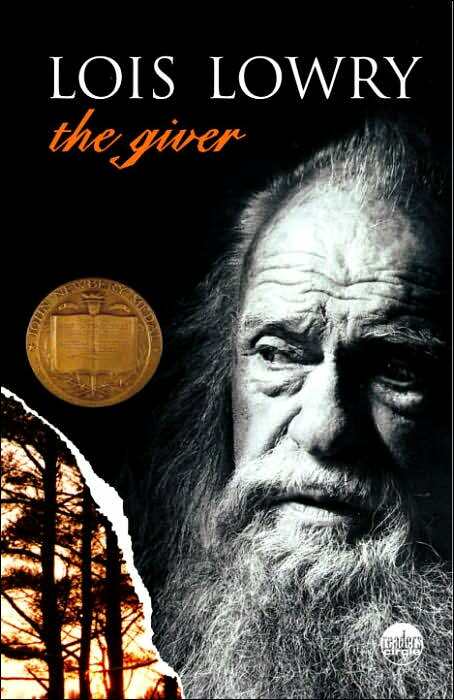 Gathering Blue is about another society that is the complete opposite of the one in The Giver, then The Messenger brings both stories together. I would highly recommend all three books! I never could really decide if I liked this book or not. I felt like I had opened my mind a bit by reading it. What I liked is that you instantly assume upon starting to read it that they can see in color and other things. It's funny how we assume things so quickly.